In October 1994, two boys, ten and eleven-years-old, dropped five-year-old Eric Morse from the 14th floor of the Ida B. Wells housing project in Chicago. LeAlan Jones and Lloyd Newman, residents of the notorious complex, documented their witness of the tragedy in a radio documentary they named Remorse: The 14 Stories of Eric Morse. These very young teens, fifteen and sixteen-years-old, were thought ideal ethnographers of “ghetto life” as a result of the previous NPR documentary they recorded in March 1993 that Jones titled Ghetto Life 101. David Isay, the author originally considered to deliver content for a public radio station airing stories concerning race and ethnicity in Chicago, served as the producer and editor of their work. Our America: Life and Death on the South Side of Chicago, blends the two award winning radio documentaries into a cohesive story documenting the lives of the occupants of Chicago’s oldest African-American public housing development. In the book’s Introduction, Isay writes that after Eric Morse’s lethal fall, “LeAlan and Lloyd spent about a year recording the story (through most of 1995). Over the course of their investigations, they became the nation’s experts on a tragedy which made headlines across the country when the two boys convicted of the crime became the youngest kids ever sentenced to prison in this country” [emphasis mine] (20). Since when did residing in a place make someone an “expert”? 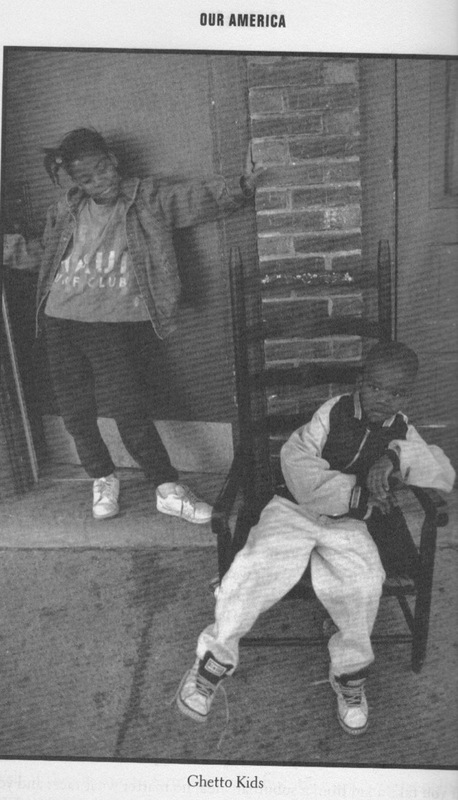 Are they, then, responsible for naming the two children in the photograph above “Ghetto Kids?” Are they responsible for the “Ghetto Glossary” proceeding the content? Were these young men attempting to cite their estrangement from citizenship in creating this Glossary? Do they see themselves as foreigners? Why is it so oddly compelling to witness how people resist, survive, and live in the terrible places they are forced to occupy and it not be equally compelling to scrutinize the people who put them there? Are these young men “experts” regarding the system that has ghettoized poverty? How would they caption photographs of the children born to the people who maintain such systems? “Privileged Children,” or “Luck of the Draw Kids,” perhaps? ” What kind of “privilege” is this? Seems more like a “flaw” to me. Here’s a picture of me as a toddler with my grandfather at our neighbor’s house. He loved me dearly, and loving me involved telling me what to do. I never lived a single day of my life in or near 1929 but because my grandmother was a child of the depression, it touched every aspect of my home life growing-up. I think about this all the time when I consider our current beliefs about how children should be raised so that they should never know hard times. This was not how people thought about child rearing when I came of age. They may not have believed in showing their vulnerabilities but the adults I knew certainly believed that children should know of their sacrifices. How much something cost or how long it took to acquire was not a secret. Do you know how much water costs? was asked of me anytime I left the water running in the sink for too long. Do you know how much electricity costs? was the question put to me if I left lights turned on or kept the refrigerator door open while I searched for something to eat. It seemed like I was always being asked to think about how much money it cost to live. I wonder why people don’t make their children think about expenses anymore? A friend recently shared with me that a year before she was planning to apply for college, her parents sat her down and explained how much money they had to spend on her education. That total included transportation costs, books, and incidentals. My friend teaches at a private college now and was reflecting on her own experiences upon encountering current students who seem surprised that their parents are struggling to afford their tuition. One student confessed that her parents asked her to transfer to a less expensive school but the student refused because “she was enjoying her experience.” I never would have been given that kind of choice when I needed my mother’s money. My mother, like my friend’s parents, would have simply told me what I was going to do. 1. No (you do not have to say yes to your children). 2. Hush (you can make your children stop talking). 3. Put that X away (your children are not entitled to video games, toys, etc). 5. Do X (your children need to do as they are told). So what do you think of my list? What would you add? We visited my son’s new school for Orientation last Friday. He met his new teacher and saw his new classroom, but he wanted reassurance that we weren’t going to leave him there on Friday, which we confirmed. So from Friday to Monday I stressed to him that he is not being abandoned or discounted in being sent into this new experience, but I also considered the possibility that he wouldn’t fully understand the significance of these words until he had to recall them in the face of his new reality. When we arrived to school he was clearly nervous, so I started going over his day with him, and as I was doing this, his teacher came over and put her arms around him and said, “I know you’re scared now, but we will have a good day together.” I thought she was pitch perfect. She honored my son’s humanity. She didn’t encourage him to abandon his assessment of the world as it was represented through her classroom; she didn’t tell him to get over it. Miss Malcolm suggested that she understood anxiety as a companion to one’s experience of a new place. She didn’t imagine that he was outside of any expectation for tenderness in his life; instead, she imagined that my son, a black boy, has had the experience of deep and abiding love…she did all of that with what seems to be such a simple gesture; it doesn’t have to cost you very much at all. In the wake of the assassination of Trayvon Martin, it was incredibly meaningful to me that this sistah recognized the possibility that black children can be afraid and sad. With this witness, Miss Malcolm showed me that she understood that black boys are worthy of comfort, care, and concern. The system failed [Trayvon Martin] when the bullet ripped through his chest, and the man who shot him said he mounted him and stretched his arms out wide, preventing him from even clutching the spot that hurt. The system failed him in those moments just after he was shot when he was surely aware that he was about to die, but before life’s light fully passed from his body–and no one came to comfort him or try to save him. In holding my son’s body close to hers, Miss Malcolm let me know that she just might believe that black boys deserve compassionate witness; that black boys need people who see their fears instead of overlooking them in favor of a racist manufacturing of their monstrosity. Miss Malcolm’s gesture suggested to me that she firmly disagrees with George Zimmerman. Zimmerman has such contempt for black boys that he dreams up stories where he makes their dead bodies resemble a crucifixion. I agree with the implications of Jonathan Capehart’s point of view on this one, since there is no evidence, no documentation that Martin’s body was found in the position Zimmerman describes, why doesn’t he have to account for this fantasy? This delusion? Doesn’t this fabrication suggest something meaningful about Zimmerman’s state of mind? Unlike Zimmerman, Miss Malcolm looked at my black son and saw someone who felt estranged from belonging in this new place. Rejecting the view that black boys who appear out of place should be killed, Miss Malcolm thinks they should be reassured of their right to hospitable arrivals. She appears to think that black boys should have an opportunity to clutch “the spot that hurt” and help in tending to these often fatal presumptions that they don’t belong–anywhere. Miss Malcolm affirmed that she understood that “Miles’s mother will come back, but in the meantime, I will take care to demonstrate to all concerned that he will live in peace until she gets here.” I tell you, it was a damn good surprise to have someone who sees your black child as having a life worth preserving temporarily responsible for their keeping. She’s a model for how a person might demonstrate their liberal views: You want to prove to me that you aren’t racist, well then how about you showing me that you Always choose to be an Aide and not an Assassin. Grilling out is a big deal in Cleveland, my hometown, because the freezing temperatures and the snow and ice storms limit your opportunities to get that grill fired up. Clevelanders see summertime, especially summertime holidays, as their one shot at grilling at the crib. When I was a kid, I hated grilling holidays because I never liked the menu my mother preferred. She liked ribs, coleslaw, deviled eggs, and plain potato chips. The only thing I could even tolerate eating was the filling bulging out of the deviled eggs, but because I understood that I couldn’t waste food, I wouldn’t eat them because I didn’t like the white part. There was usually fruit around the house so that’s what I typically ate on those occasions. So I know now that if I’m in Cleveland, I don’t hang out with my mother on grilling holiday; I go to my Aunt Janet and my Uncle B.B.’s house. On grilling holidays, they ALWAYS have the kind of grilled food I enjoy: hot dogs, hamburgers, baked beans, macaroni and cheese, green beans, and boneless, skinless chicken breasts. For dessert, they might have apple pie and ice cream. I eat all of that (though I would only eat turkey dogs or turkey burgers). On the Fourth of July this year, I went to my Aunt and Uncle’s house and they PUT IT DOWN! The chicken they made was sooooo tender you could cut it with a plastic fork! So between my husband and I, we got a sense of how they did it. First, my husband saw my Uncle take the meat and put it on the grill. He didn’t seem to fool with it too much; he might’ve flipped it over every 10 minutes for about 30 minutes and then pulled it off his covered charcoal grill. He then saw my Uncle give the chicken to my Aunt who put it into a casserole dish filled with bar-b-que sauce and put it in the oven on a very low temperature. I tried to convey to them how much pleasure I took from the meal, but my words seemed so inadequate compared to that glorious food. When I asked my Aunt how she got it to be so tender, she told me that she first tenderized it with a mallet. Next, she seasoned it and put the meat into a plastic bag and added a marinade. So the FIRST thing I did when I came back home to Atlanta was to buy myself a mallet (and I had Kohl’s cash and a coupon) ! Before, I had been using the underside of a small pot to flatten parts of the chicken or I would puncture it with a fork thinking it would allow for the marinade and spices to flavor the meat. Let me tell you, if you want the experience of eating chicken that is so tender you can cut it with a plastic fork, go out as soon as you can and get yourself a mallet. Yesterday, while my husband readied the grill, I allowed my son to use the mallet to pulverize the meat. Next, I seasoned the chicken with salt, pepper, garlic powder, and paprika. After that, I put the meat into a plastic bag and I poured balsamic vinaigrette over the chicken until the meat was fully covered. I think the meat had a chance to marinate for about three hours. After that, my husband put the meat on the grill and let it cook between 30 and 45 minutes. When he took it off the grill, he used a casserole dish that had been sprayed with Pam and poured the bar-b-que sauce over the chicken just to cover it. He then put the meat into a 275 degree oven and we let it braise in that covered casserole dish for at least two hours. When we put a fork into that meat to test for doneness, it was so tender it was falling apart! My Aunt and Uncle knew what they were doing! In following their example, we had the most delicious meal yesterday. If I was really into making money and selling stuff, I think we’ve got something to sell. But I’m straight with what I have so I prefer to give you this simple method for life changing food without cost. If you try it, let me know how it turns out for you. I’ll give you a picture of what ours looked like later. The picture’s not in my cloud and I can’t seem to get my phone to email the photo to my account. Technology. Try this grilling/braising method. You will not be disappointed.